Gather round, kids. 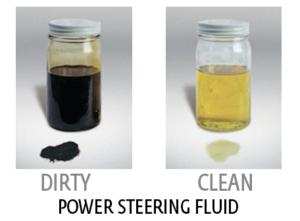 This month, we’re discussing the all-powerful power steering fluid. Power steering is one system that is often overlooked in routine maintenance, and manufacturers recommend that you change the fluid every 30k miles. Take a look at your odometer and try to remember the last time you did this. Go ahead, I’ll wait. I’m guessing it’s been awhile, probably more than 30K miles. The reason you should regularly change it is because over time, power steering fluid degrades, meaning it’s no longer its best self and it can’t do what you need it to do. When this happens, steering your car becomes noticeably more difficult, and you may hear a growl or groaning noise — especially when turning the steering wheel. This is your car crying. Fluid contamination is the leading cause of component wear in power steering systems. And the debris from said component wear becomes suspended in the power steering fluid, making the problem even worse. Let’s consider what happened to our of our customers, who we’ll call John (to protect the innocent). He owns a 1996 Toyota Tacoma. This Taco arrived last week with 226k miles on the ticker, and John had not followed the routine maintenance schedule for his beloved truck. As a result, the vehicle was exhibiting hard steering and a growling noise. It was an angry Taco. In fact, the power steering fluid ended up being so dirty and contaminated that although we bled the nasty old fluid out and replaced it with brand new pretty fluid, we could not save his power steering pump, as the damage was already done (insert sad face). The photo on the right isn’t the exact one in this case, but it gives you an idea of how just how dirty this fluid can get. Pretty darn dirty. And that’s how you end up with a sad Taco. The moral of this car tale: If John had followed the routine maintenance schedule for his truck, he would have spent around $75.00 for power steering system service, instead of $400.00 for a total pump replacement. Think of what you could buy with an extra $325. How about some more maintenance for your car? Or a weekend vacation — totally your choice. So please give us a call if you are experiencing any steering issues with your car. And even if you aren’t, if you come to us for your routine oil changes, we’ll thoroughly inspect your car and advise you if anything needs some maintenance. We prefer helping our customers avoid the big repairs by keeping their cars behaving and happy. Thank you, and happy motoring!